Special operators from the Army, Air Force, Navy and Corps all operate in Helmand province, where tens of thousands of Marines have deployed in recent years. In particular, Amos said forces with U.S. Special Operations Command can be found across Sangin and Kajaki, violent districts where Marines have engaged in heavy combat. Those special operators get a variety of support from conventional Marine forces, especially with aviation, Amos said. The comments came during an address at the Center for Strategic and International Studies. Amos also touched on the U.S.’s budget constraints, the needs of the Corps and what the service should focus on after the war in Afghanistan. 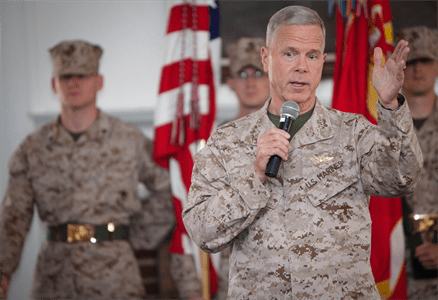 The address marked the first by a member of the Joint Chiefs since President Obama was re-elected to a second four-year term on Tuesday night. Amos didn’t discuss the presidential election, but said the relationship between the Joint Chiefs is excellent and will help as the U.S. grapples with tough national security decisions in a time of financial austerity. Amos said the U.S. is probably about a year and a half or two years into a 10-year period of tight budgets, citing previous post-war drawdowns. That means the Corps will focus on modernizing only where required. “We’re flying now 40-year-old CH-46 helicopters. We have to modernize those,” he said, a nod to the Corps’ ongoing fielding of the MV-22 Osprey, which will replace the CH-46.